Sony Online Entertainment LLC (SOE) is kicking off its annual Halloween seasonal events and promotions for players across its games portfolio, including DC Universe™ Online, Dragon’s Prophet, EverQuest®, EverQuest®II, Landmark™, and PlanetSide®2. With many activities already underway and extending as far as through early November, players will be tricked or treated to in-game Halloween events, contests, activities and promotional items in each game. This year’s treats will also feature Halloween items created by players through SOE’s successful Player Studio program, offering them the opportunity to create (and earn money from) in-game items sold in the marketplace of their favorite participating title. Players are encouraged to login daily as to not miss any of the festivities! The Witching Hour is back! Everyone’s favorite witch-boy, Klarion, has returned to Gotham City this year, and he’s up to his old mischief as Halloween approaches. All previous years’ activities and rewards are back, including the Midnight Masquerade under the Events tab in the On-Duty menu, and a redecorated Gotham City. To help players get even more ready for the season and assist in any Haunted Bases or Halloween Party planning, the Halloween Sale is also now live in the Marketplace, including savings up to 30% on various items. For more information visit: https://www.dcuniverseonline.com/news/archive/dc-universe-online-halloween-event-and-sale-2014. We’re bringing back the Styx Festival Halloween Event, which opens up a special zone with Halloween themed events! Aspiring Prophets must once again muster up the courage to adventure through a haunted Auratia while battling Abyss dragons and other monsters. Players will also have access to new Halloween-themed items, including transformation potions that will change players into skeletal warriors, zombies and more – plus lots of season-themed weapons, eggs, and housing items on sale. For more information visit: https://www.dragonsprophetthegame.com/. Norrath is a bit creepier and crawlier than usual, with a number of seasonal tricks and treats as well as the occasional undead encounter. It’s the time of year, once again, as necromancers emerge from the shadows and darkness begins to fall across the lands! Brave Norrathians must be on their guard as vampires roam in more places than just Kithicor Forest. Both tricks and treats are plentiful as festive merchants return to starting cities just in time for the holiday celebrations. Are you ready for some spooky adventures? Nights of the Dead has returned to Norrath. For more information visit: https://www.everquest.com/news/nights-of-the-dead-2014. No area of Norrath is safe, as the chill sets in and darkness falls on the lands. Ghouls begin to emerge from the shadows and both tricks and treats are plentiful. Whether players enjoy crafting holiday items or are looking for a spooky adventure, there’s something for all Norrathians to celebrate as Nights of the Dead returns to EQII! For more information please visit: https://www.everquest2.com/news/nights-of-the-dead-norrath-2014. There’s a brisk chill in the air, the nights are getting longer, and pumpkin-spiced everything is filling the shelves. And, of course, Halloween decorations are beginning to appear! In Landmark, we are celebrating this happily haunted time of year with a building competition! The theme for this competition is Halloween, of course! What does that mean? Could it be a cute trick-or-treat neighborhood? A spooky graveyard? A haunted hotel? A gigantic pumpkin sculpture? YES! All of those and more. If it’s Halloween-themed, players can submit it to the competition, which ends tonight at midnight PDT. Winners will be announced by Oct. 29. For more information please visit: https://forums.station.sony.com/landmark/index.php?threads/spooky-spots-happy-haunts-its-time-for-a-building-competition.48832/. 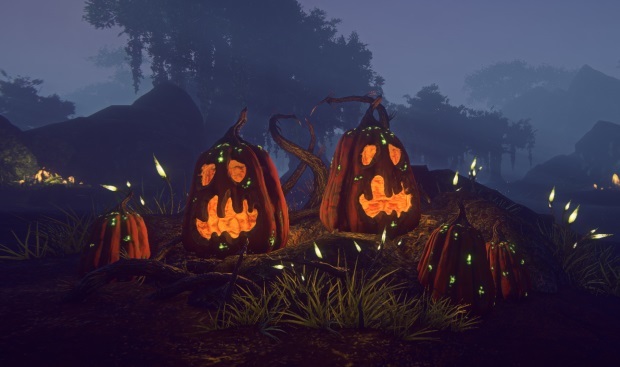 A brand new seasonal event, “Nanite of the Living Dead,” has been introduced, featuring a new Pumpkin Hunt alert and the chance to purchase limited-time only masks, plus multiple other spooky seasonal activities to enjoy. For more information visit https://forums.station.sony.com/ps2/index.php?threads/game-update-10-2.202869/. Since launching in July, Trove has been rapidly taking off with players.